This is a 1/64 scale die-cast car model of Toyota Himedic by Tomica of Takara Tomy. 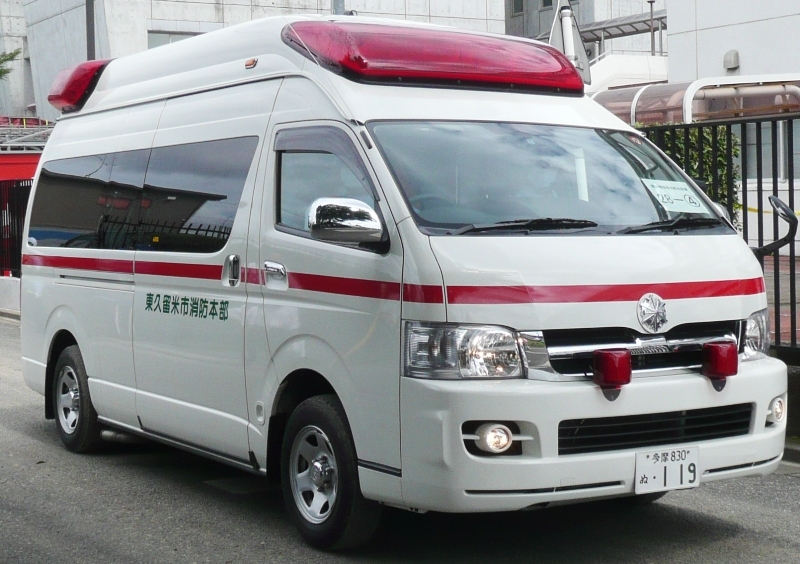 This is basically a Toyota HiAce Van H200 series converted into an ambulance. The Toyota HiAce is a motor vehicle produced by Toyota was first launched in 1967. The HiAce has since been available in a wide range of configurations, including minivan (MPV) and minibus, van, pick-up, taxi, and ambulance. In Japan the HiAce is exclusive to Toyopet Store locations. The fifth-generation Hiace appeared in 2005 as a wide long-wheelbase wagon, wide super-long-wheelbase high-roof "Grand Cabin", long-wheelbase van, long-wheelbase high-roof van and a wide super-long-wheelbase high-roof van. In this generation the gear stick has been moved to the dashboard to enable easier movement in the cabin. Five-speed manual and four-speed automatic transmissions are available. All of the models use a four-cylinder DOHC engine, in a variety of forms, a 1TR-FE 2,000 cc or 2TR-FE 2,700 cc petrol engine, or a 2KD-FTV 2,500 cc or 1KD-FTV 3,000 cc D-4D turbo diesel engine. Two of these engines are available in Malaysia, the 2.5 L turbo diesel, offered in a choice of panel van or window van; and the 2.7 L petrol, that comes only in the window van option. As a scale model, the paint job finishing is quite decent but in terms of detailing, it is not great, I guess it's almost minimalist but somehow better than average. Nothing great to see in there just typical minimalist approach but I think at this scale this should be reasonable. Overall, this is a decent scale model of the Toyota HiAce H200 in ambulance configuration by Tomica of Takara Tomy. I personally feel that despite the simple minimalist approach, the finished product is somehow still look almost the same with the actual vehicle. I have no complain what so ever in this one though I have 1 wishlist which is it would be good if the interior is painted with black instead of the current white.